This year Mr. J and I got some great food and cooking related holiday gifts and I wanted to share them! 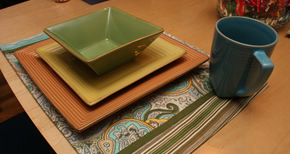 Here’s a roundup of these fun items. Our families know us too well. Cast Iron Skillet for the grill, and an authentic deep dish Pizza Pan from Lou Malnati’s in Chicago. I’m so excited to whip up some pizza soon! We can’t grill outside the condo, but someday we’ll own a house and can grill year-round (or when there isn’t snow covering it). 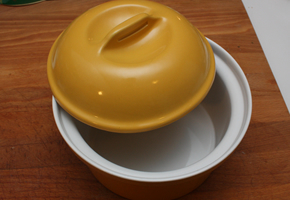 I asked for bakeware and this one is so fun! I love the yellow. You’re sure to see some posts come out of this. We got some tools as well. 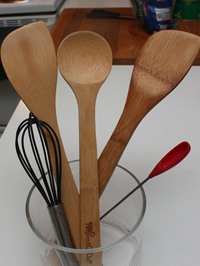 3 Wooden Pampered Chef spoons & spatulas, a set of new whisks, and a nifty little spoon to get to the smallest quantities. 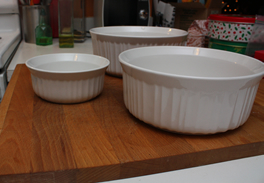 I got a set of 3 CorningWare baking dishes with covers. Great sizes. Now I have options to whip up double batches and freeze them. 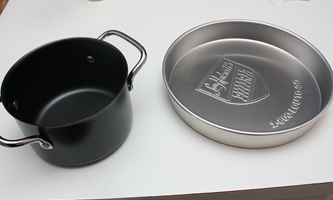 Lastly, we got a set of everyday dishes from Bobby Flay…or from Mrs. E & Mr. T but made by Bobby who will always have a special place in our hearts since we got engaged at his restaurant, Bar Americain. Mr. J and I got a few cook books and some fun ingredients that I’m sure will make an appearance soon. This is a great meal to come home to or to pull out of the freezer (adding drop biscuits just before cooking). I’m not a fan of peas, so I don’t include them in my pot pie. In the past, I’ve included edemame for some color. 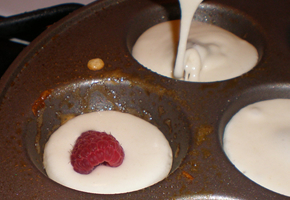 Individual ramekins would mean you could customize per person! How fun?! Turkey instead of chicken, sweet potatoes, celery, turnips, or anything else you like of would be great additions too. I make this occasionally and thought it was a great use for leftovers too! I made a crock pot recipe the other day which wasn’t great. 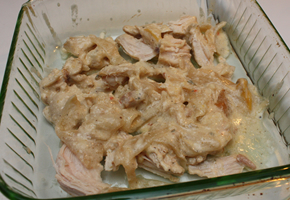 It was chicken, white wine, cream cheese, onions, and a packet of italian dressing. 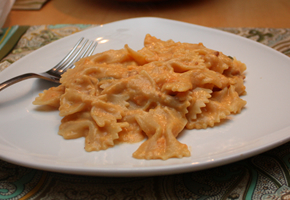 I served it over egg noodles and it was OK but not overly blog-worthy. When photographed it showed how white it was! 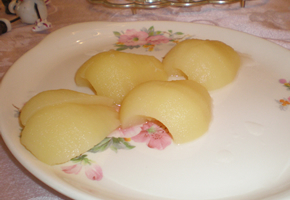 1) Cook potatoes and preheat the oven to 375 degrees. 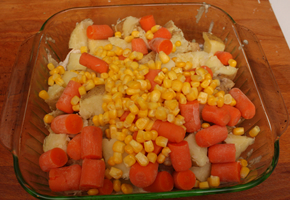 2) Cook carrots and corn. 3) Tear or dice chicken and put into a greased 9” pan. 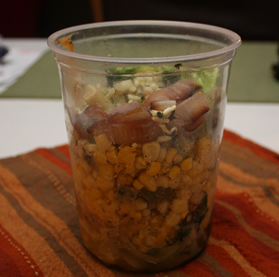 4) Add chopped potatoes, chopped carrots, corn, and onions. 5) Combine cream of celery soup and milk. Pour into pan. 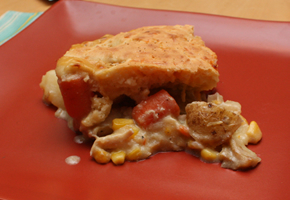 6) Mix the pot pie insides and spread drop biscuits onto the top. 7) Bake 30-40 minutes at 375 degrees. 1) Combine flour, salt, baking powder and sugar in a bowl stirring well. 2) Cut in butter to form small chunks. 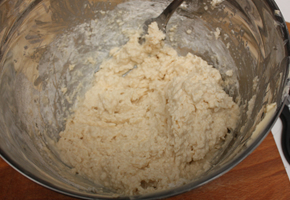 3) Stir in enough milk to form a wet batter (I make it more soupy when it is for topping). 4) Mix in cheddar (if desired). The drop biscuits don’t look great, but trust me, it is awesome when baked. This time I turned the broiler on for the last 2 minutes to get it more golden once I was sure the biscuit was totally cooked and not gummy underneath. 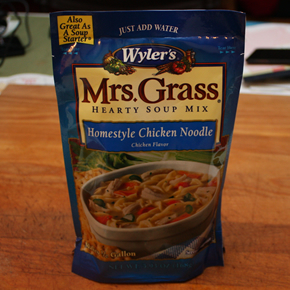 I like these amounts but thought about mixing the insides with cream of celery soup and a cup of chicken broth. I’ll probably try it next time. Sometimes I make a second one and leave off the topping to freeze it. Just add the topping before baking. Pie crust or puff pastry would make a good topping too, but I’m partial to the biscuit myself. Enjoy! If your holiday season was anything like mine it included goodies of all kinds, and often. Here’s a journey through the last few days of family, friends, and FOOD. 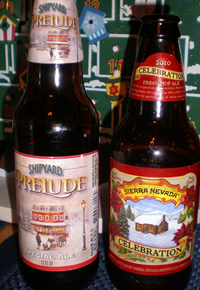 A holiday gathering with friends was made more special with delightful holiday beer. Of course they had the regulars as well but I’m a sucker for seasonal beers. I thought it was a really nice touch to have a few seasonal varieties on hand. 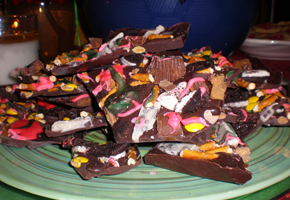 Some other fun additions they served was a decadent bark. This would be a fantastic post-halloween treat as well. Bittersweet chocolate was topped with pretzels, melted red & green chocolate, and all the candy and cookies you can think of. Bittersweet chocolate was definitely necessary since milk chocolate would make it over-the-top sweet. The pretzels added a nice sweet/salty/crispy aspect. 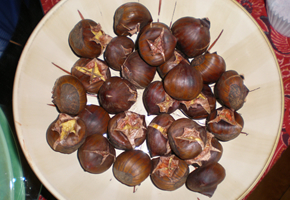 Lastly they served roasted chestnuts! I hadn’t ever had them but fell in love. They have a real woodsy flavor. They are meaty and substantial. A little cut on the bottom made them easy to pop right out. Check out how nicely the bowl complimented the nuts too! Ok, lets move on to some holiday meals. 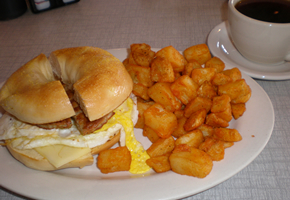 Breakfasts are my favorites. 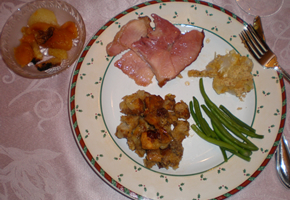 Christmas Eve was already my 2nd day of holiday celebrations with the C family and we had a crockpot scramble dish including ham, egg, cheese, and shredded potato. 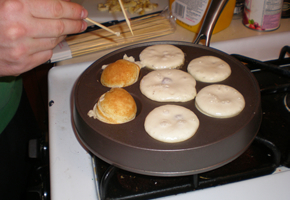 We also served Ebelskiver (translation: dutch filled-pancake). These are tasty and really fun. Mr. J is a master at turning them so he did the honors. We filled them with raspberries, banana, and chocolate chips. More than 3 options just gets confusing. The pan only allows for a few per batch but we found out the first time making them that this is probably all that we could keep up with at a time anyway. Williams Sonoma makes fancy turners for $12.95 but bamboo skewers work just fine. We kept them warm in the oven while making the rest. I’ll post again about these…they’re that good. After discovering a Christmas journal from 1987 we realized the R fam has been eating a traditional Christmas breakfast since at least since then. 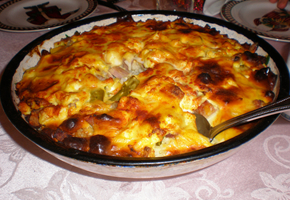 It is a casserole (to be made the night before) with rice, eggs, velveeta, ham, and asparagus. It’s delectable and nobody is ever ready for a change. The other benefit is that it just gets popped into the oven while gifts are in progress and nobody misses anything! We also have a partridge and a pear tree, minus the partridge. Though I’m not sure why, the top of the tree gets a sugar cube with a drop of flavored extract lit on fire for a second. Dinner time? There’s no set tradition with the R family so this year we had ham. Yum! Sides included the best sausage stuffing ever, creamed onions, green beans, and a baked fruit on the side. 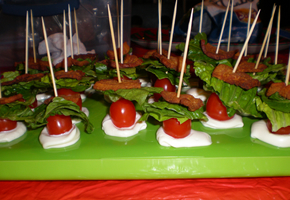 Check out the BLT skewers I made with Mrs. C. She brought them to church on Christmas Eve and they were such a hit. How is it that I’ve never had super thick cut bacon? I’m now enlightened. Wow. We cut one end of the grape tomato off to make it stand better. One last delectable thing I ate (and ate) was sis’ sticky buns. The recipe will follow soon! Hope everyone else had great meals too! I loooove to make calzones. I think the ratio of crispy crust to inner fillings or would-be pizza toppings is the best. 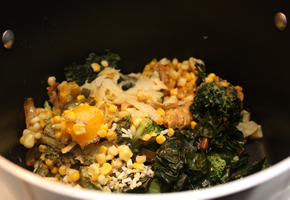 It is also a great use for leftovers or the occasional less-than-perfect ingredient. 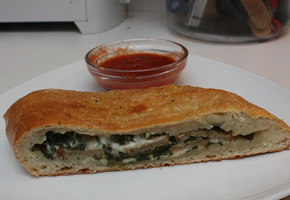 This calzone was turkey meatball, fresh spinach, and cheese. 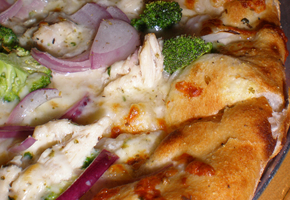 Dough definitely plays a big role in the calzone but dough varies in ease and quality. 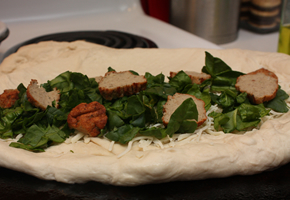 I went with refrigerated dough and pre-made turkey meatballs. The trick is to fill the calzone much more than it looks like it can hold. Calzones fall into those “contents may settle while in motion.” I bought a ton of spinach and thought I could use it here. 1) Stretch pizza dough out using your hands and spread out on lightly greased pan. 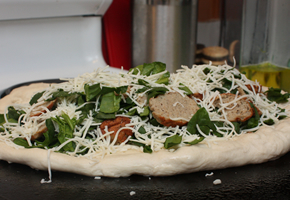 2) Top half of dough with sliced meatballs, spinach, and cheese alternating layers. 3) Fold over and secure all the way around. Make a few slits to let steam out before brushing with eggwash. 4) Bake at 375 degrees for about 30-minutes until golden brown. Some of my other favorite calzones include: green apple, brie, and prosciutto; chicken parmesan; and ham and cheese. Literally anything could fill them up but I draw the line at going too far out of the box with Chinese or Mexican. That’s just crazy. Calzones are great appetizers or as a meal. I might bring some to Christmas with the future in-laws! Our winter girls family get-away weekend included one of the best meals I’ve had in a long time. 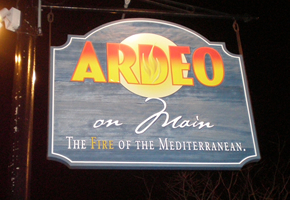 We dined at Ardeoa Mediterranean restaurant with 5 locations in Cape Cod. I simply adored it. It was one of the best meals I’ve had in awhile and I can’t say enough good things. Mum, Sis, and I loved each bite. Mediterranean cuisine is definitely a favorite of mine because of some of the spices and the unique flavors. There was such a great freshness and boldness that I was 100% content with my meal choice.I had lamb mousaka. I saw it and knew I couldn’t pass it up. Lamb is the only red meat I eat so I was pleasantly surprised to see this Greek classic made with a twist! Lamb instead of beef? Yes please! It was served on what would be a serving platter in my home. I ate it for two, albeit hefty, meals. 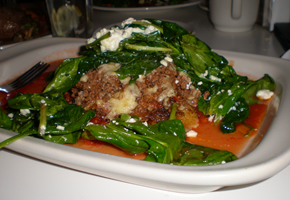 The menu boasts: flash fried eggplant with seasoned ground lamb, sauce bechamel, thinly sliced potatoes, spinach and feta cheese. This doesn’t do the plate justice. I loved the eggplant, cooked perfectly and not at all bitter. 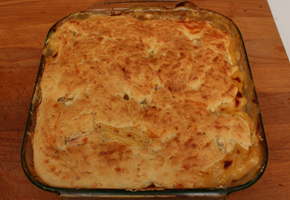 The sliced potatoes were great since often they are whipped for mousaka. The feta was salty and there was a MOUND of fresh spinach barely wilted on top. I did have to dig a bit to get to my dinner beneath the leafy green. Delicious nonetheless. Mum got a petit leg of lamb stuffed. 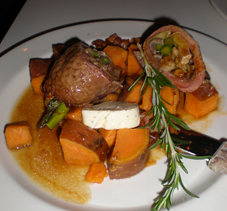 The lamb was perfectly pink and stuffed with brie and asparagus. There was a sweet potato hash and a sauce beyond her words. Mum smartly didn’t try to take any home knowing it wouldn’t be the same reheated. Sis got Eggplant Rollitini. 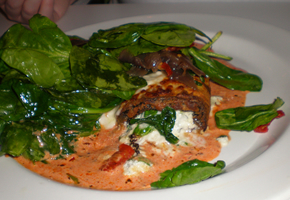 Her eggplant was also flash fried and then stuffed with garlic, basil, spinach, ricotta, and Romano cheese. It then is baked with mozzerella and pink sauce. Hers was also topped with a MOUND of fresh spinach too. This meal was really great. Fire roast anything and it’ll be better. I thought the ingredients were incredibly fresh tasting. How refreshing that they serve quality food done right. There weren’t any crazy surprises. Everything just worked and the talent of the chef was obvious. Dislikes: no locations near me, too much spinach on some entrees. Flatbread Company at Sacco’s Bowl HavenBowling and beer. What a great combo? 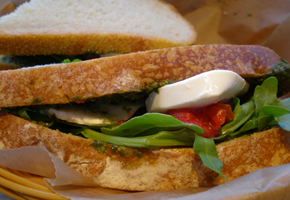 Flatbread Company thought so for their newest location in Davis Square. This isn’t your average pizza and I was really impressed. Mr. J and I had a Sunday afternoon date and loved it! FYI, Sundays are QUITE busy. We reserved a lane and came back for our pizza before bowling time. 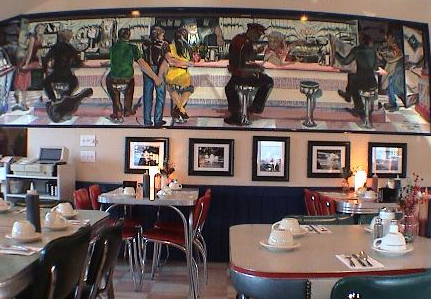 We had been meaning to go for a while and our Groupon was just the motivation we needed. The bar area was huge and since a large group was about to move into the dining area so we chose to sit at the bar. The bartenders were friendly and attentive. 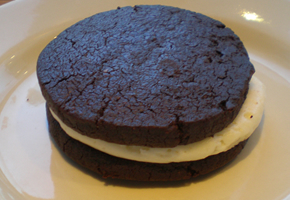 We chose ½ and ½ from the specials menu. 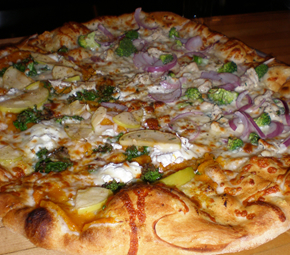 One half alfredo, chicken, and broccoli, the other half butternut squash, apple, ricotta, and dried cranberries. Wow. Delicious. The crust was crispy and had great doughy bubbles. The white side (contrary to the orange side) was definitely lacking in the chicken criteria. I loved the broccoli florets. The alfredo was creamy and the perfect amount. The orange side was my favorite. I was oooing and awwing so much I couldn’t bite as quickly as I wanted to. The butternut squash was sweet and nutty. I’m not sure, but I believe Flatbread Company made the ricotta. It was amazing, homemade or not. Apple slices rounded it out but our pizza was missing the dried cranberries. I’d definitely be back to Flatbread Company. These pizzas are delicious and worth it. I see a take-out flatbread in my future. I wish the server had mentioned that we’d pay a lot more to have half and half, but it was worth it. 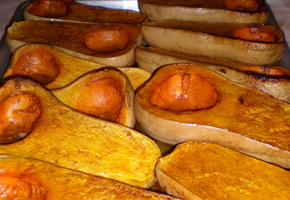 On the way out of the bar we got a peek at the baked squash I had just enjoyed so much. Look how amazing they look! Bowling was fun but it was highly disorganized. Everyone’s games end at the same minute AND you have to keep score yourself. If you’re anything like me and have spent more bowling time tying laces on your friends funny shoes than learning the rules, then you too don’t know how to keep score. We just played until we had our fill and left our shoes to be sprayed. 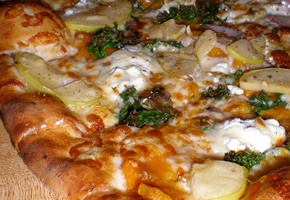 The atmosphere is part old-school bowling ally, part stylish organic pizza. This is a genuine good time.